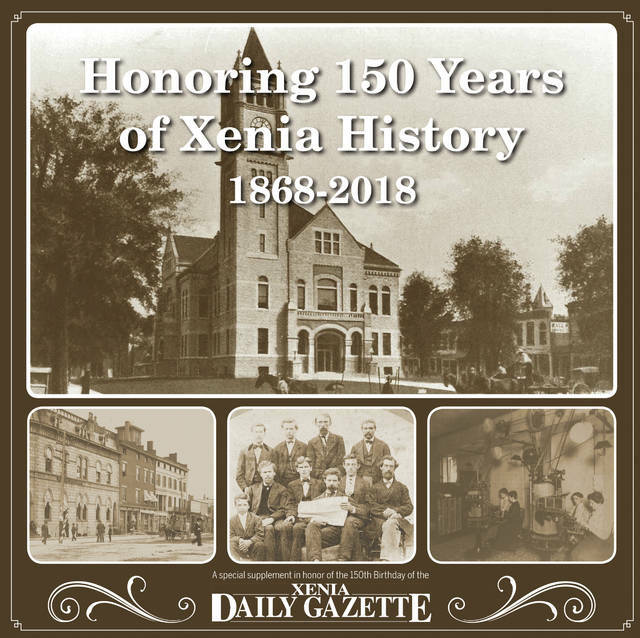 XENIA — The Xenia Daily Gazette is celebrating 150 years Saturday, Aug. 18. In honor of that birthday, paid subscribers will find a special Honor History section in the Xenia Daily Gazette and Fairborn Daily Herald. This special supplement celebrates 150 years of the paper as an integral part of the Greene County community and how it continues to be dedicated to providing the best local news. This 50-page special section shares the history of the Gazette, businesses, famous people, and a variety of memorable events in history. – The three founders of the Xenia Gazette were John F. Patton, Warren Anderson, and Thomas L. Tiffany. Their experience in the field of journalism was of varying degrees but they came together in 1868 to publish a newspaper which is still in circulation today. – It was all hands on deck to get the Gazette out to the community after the deadly F5 tornado ripped through the city April 3, 1974 — but staff members weathered the storm and delivered a paper the following day. – While it boasts itself as the City of Hospitality and the Bicycle Capital of the Midwest, Xenia can also lay claim to being among the leaders in rope making. – Through all the years that Major League Baseball has been around, and through all those games, a Cedarville man is the only one to have turned a particular feat. A special thank you goes to Catherine Wilson, director of the Greene County Historical Society and former director Joan Baxter for all their help and contributions to make this special section possible. Photos are courtesy of our local businesses, Greene County Historical Society, and Gazette archives. News staff contributing to this publication include: Anna Bolton, John Bombatch, Merrilee Embs, Scott Halasz, Natalie Jones and Whitney Vickers. Advertising staff contributing to this publication include: Catherine Chambliss, Carol Kahle, Nancy LeBeau and Barbara Vandeventer. The section will be available for $5 at the Greene County Fair booth through Friday, Aug. 3 and at the Gazette office, 1836 W. Park Square.